Nautical theme has always been favorite interior design theme for a lot of people even though their house might not near any beach. If you want to apply this theme inside your house, it is actually very easy since you could use nautical home décor to do so. Even with a little decoration, you could change your room to be better and feel like a beach house. Start with something simple to do and see if it suits your taste. Then you can move to bigger decoration to completely change your house into those coastal homes you always dream of. A signature color of nautical themed interior design is the use of blue and white color. Those colors represent the blue sea and the white sand which is very beautiful. Then you can use those colors all around the room to apply the beach feeling inside your house. Do not forget that you need to keep those two color balanced so if you use blue background then use lots of white items and vice versa. You can apply the style not only in your living room but also your bedroom, kitchen, and even dining room. If you have some areas that need tiles, then try to find tile with fish scale pattern. The color of the tiles does not need to be in white and blue since it could be anything from aquamarine to crème sand color. The most common place that you could use those scale is in your bathroom, both on the wall or on the flooring will do for nautical home décor. Another place that you could apply the tile is on the kitchen backsplash or on the fireplace. To absorb old nautical time when people still explore the world to find new island, you can hung old nautical map on the wall. But if you could not find old map then any map will do. Try to frame the map if you can, or just attach them directly on the wall. There are also some old map paintings that you could use as nautical home décor. You can place the map anywhere around the house, most common would be on your living room but you can also use it on the bedroom or even dining room. Sailing boat is an icon of nautical theme room, which is why you must try to use some sailing boat miniature as part of your nautical home décor items. The sailing boat could be big if you have room to place it but if you do not have that much space, then small miniature which you could put on the shelf is enough. It could be old sailing boat with wooden color, or modern sailing boat with white color. Just choose sailing boat style which suitable with your room color scheme. Nautical theme also suitable with wooden material, so you can use a lot of wooden brown tone on your beach themed room. If you have wooden structure ceiling, you do not need to get rid of it since it is already suitable with your coastal theme. If you lack of wooden material, then you can use it on your furniture such as seating, table, bed and many others. Then you can add several nautical home décor that we have mention above to your room and complete the design. Easiest way to create beach themed house is to spread small decoration around the house. Whether it is wall art, craft or even painting that you could hung on the wall, some accessories that you could put on top of your tables, or even other useful accessories which has specific function. Choose those small decorations that has nautical theme, and then you will be able to create coastal house easily. However you must spread that nautical home décor evenly around the house and not just pile them on one corner since it will make them unbalanced and weird to see. If you want to create the perfect beach themed house, then you should try to pay attention towards the detail. 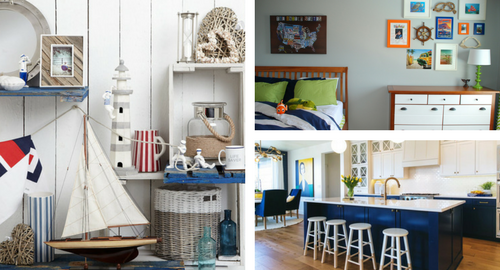 Mix and match each nautical home décor so you could find the perfect balance on each room inside your house. But do not overdo in using the decoration since it will be too much and people will feel suffocated from it. That rule also applied for the blue and white color since if you are not be careful you may use too much blue color which make the room become blue room instead of nautical room, so balance is really the key to create your dream nautical house.